A moving book and especially apropos now. No matter what side you take on the war in Iraq . Chicoine, the executive director of Twin Cities Urban Reconciliation Network, profiles more than 90 soldiers — men and women — who are buried at Fort Snelling . Each ends with the numbered grave site, should you want to go and pay your respects. It’s not the sort of book one reads at one sitting, but it’s worth revisiting. Again and again. The small white tablet above Army Capt. Bernard Pepper’s grave at Fort Snelling National Cemetery looks like the other markers that stretch row on row over the cemetery’s 436 acres — nearly 170,000 markers in all. The tablet at Section B, gravesite 134-A, reads only “Bernard Michael Pepper, MN, Cap’t, 5 Cav, 1 Cav div, WWII, Korea, May 10, 1914, Sept. 22, 1950.” The small white tablet above Army Capt. Bernard Pepper’s grave at Fort Snelling National Cemetery looks like the other markers that stretch row on row over the cemetery’s 436 acres — nearly 170,000 markers in all. No headlines marked Bernard Pepper’s passing more than 50 years ago. Most people who visit the cemetery today will stroll right past his grave, without any idea of who he was or what he did for his nation. But it’s the stories of soldiers like Pepper that have become a life’s work for Steve Chicoine, an author and historian from Eden Prairie. 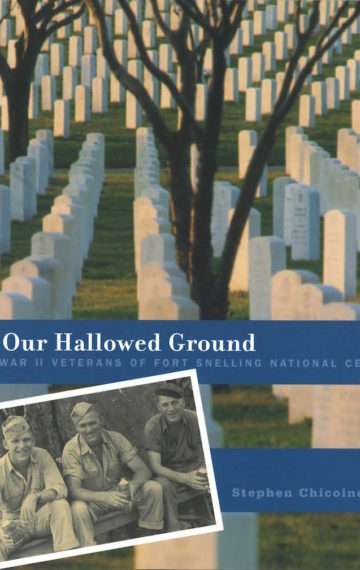 Chicoine’s book, “Our Hallowed Ground,” published in 2005 by the University of Minnesota Press, recounts the stories of 87 World War II veterans who are buried at the Fort Snelling cemetery. The book profiles both men and women, and members of all branches of the service. “You don’t have to go to Arlington Cemetery or Washington, D.C,” says Chicoine. “We have a shrine to democracy right here.” “Our Hallowed Ground” opens with profiles of Seaman Second Class Ambrose Domagall (Section R, grave site 800) and Coxswain Karl Lasch (Section R, grave site 3252), both of St. Paul. They were on board the destroyer USS Ward early on Dec. 7, 1941, when it fired America ‘s first shots of the war at Pearl Harbor. The book closes with Army Sgt. George Tadashi Tani (Section 6-C, grave 799), a Japanese-American and later a Twin Cities physician, who visited Hiroshima in 1945 and was reunited with his two sisters while in Japan. Chicoine is particularly drawn to the soldiers who have no family left to treasure their memory. “They died at 19 or 20, with no wife, no children,” he says. “At most, they have a nephew who lives in California or Alabama. People lose touch.” Chicoine wants to honor the sacrifice of all, and preserve their legacy. “Our Hallowed Ground” is the fruit of Chicoine’s unique modus operandi: a combination of hunches, military knowledge and tenacious sleuthing. For most who serve in combat, war is a personal experience and no two people come away with an identical ‘picture’. Stephen Chicoine has blended the unique experience of the many to effectively paint a landscape reaching from the British Isles to Africa, from the South Pacific to D-Day, and encompassing the entire war from Pearl Harbor to V-J Day. A most interesting read. Review by Harry J. Herder, World War II veteran, Fifth Ranger Battalion. It would be nearly impossible to write about all the veterans buried at Fort Snelling National Cemetery, but Our Hallowed Ground honors the memory of each of the men and women who now rest there in peace. Our Hallowed Ground is a reminder of the service and sacrifice of thousands of young men and women who defended our nation with valor in World War II. These stories should motivate all of us to visit Fort Snelling National Cemetery to pay our respects to ‘the Greatest Generation”. Our Hallowed Ground is a splendid book. It is full of moving stories and important World War II history … I am proud to be mentioned in your book. Wonderful book. I read every biography. As a Minnesota historian, I am very happy that you have focused on a group of heroic Minnesotans and made known their contributions to our heritage. I can see that the research was a labor of love. As a veteran, I’m proud that some of my fellow servicemen are honored for the giving they did.